What Are Georgia Dram Shop Laws? Bars, restaurants, night clubs, convenience stores, liquor stores, grocery stores as well as concert and sports venues. Waiters, party hosts, and other alcohol servers. 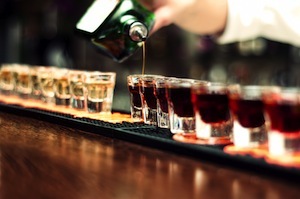 A lawsuit brought against one of the above individuals or businesses typically happens when they have served alcohol to a patron or guest, and that person injures someone else. For example, if a restaurant patron is served alcohol when he is visibly intoxicated, then gets in a car and kills someone on the way home, the restaurant can be sued for damages. The victim can bring a civil action against the server and the owner of the restaurant. The purpose of dram shop laws is to prevent the selling of alcohol to individuals who are visibly impaired and to minors. Alcohol was served to the patron by the bar, restaurant, alcohol retailer, or even a host at a private party. There is evidence that the server of alcohol noticed or should have noticed that the patron was intoxicated when serving him with alcohol. There was also knowledge that the patron would soon be driving a motor vehicle when being served alcohol. The patron caused injuries or other damages. Proving fault of the alcohol provider can be a difficult task. The most important questions that arise are how visibly intoxicated the patron was before being served more alcohol, and did the server know that the person was going to drive a vehicle. These issues are also the reason why it is critical for an injury victim to hire a skilled attorney. An experienced Georgia dram shop attorney will be able to investigate all the facts, such as the amount of alcohol served, who served it, and how long the patron was drinking at the alcohol provider’s premises. If you or a loved one has been injured or killed by an intoxicated person, contact the legal team at Katz Wright Fleming Dodson & Mildenhall LLC today at (404) 460-0101. Your initial consultation is free, and you pay no fees unless we win your case. We represent injury victims across the state of Georgia, including Atlanta, Marietta, Jonesboro, Columbus, and Athens.